With steamy & hot weather upon us, there’s nothing like cooling down with a bubbly cocktail. It's time to think outside the flute with cocktails from Freixenet Cava. Made in the traditional méthode champenoise, Cava bubbles last longer than Prosecco and it is easy to balance with most fruit flavors, giving you the perfect complement to any fruity cocktail of your choice. So whether you are planning an afternoon by the pool or a dinner party with friends al fresco, a summertime cocktail made with Freixenet Cava is the perfect thing to serve. Refreshing and light! Disclaimer: You must be 21 years of age or older to consume alcohol. Please drink responsibly. 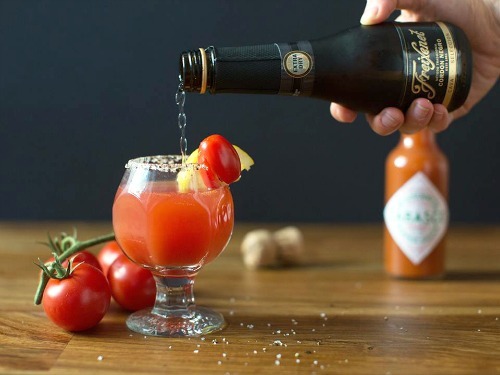 This drink is similar to a Bloody Mary,but sparkling with champagne. It does sound interesting.